Restoration is key after floods and fires and is a constantly evolving industry. In addition to keeping up with industry best practices for health and safety of both the contractors and the building residents post restoration, it is also important to be working with modern and reliable restoration equipment. Utilizing Omnitec Design Inc and OmniAire products will allow you to take advantage of the latest best practice methods with equipment you know will work reliably and safely. Within the last few years, there has been an industry-wide move towards using heat to increase the evaporation rate of moisture in materials. 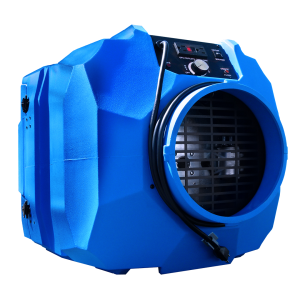 Most modern dehumidifiers (LGRs) have increased their range of ambient operating temperatures as high as 125°F to support the use of external heaters on the jobsite. 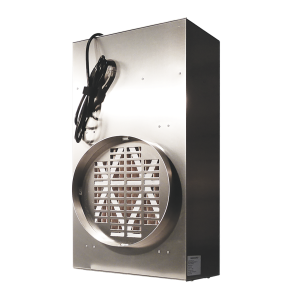 Omnitec Design offers two models of the Vulcan electric heat drying system; the smallest and yet most powerful electric heat drying units on the market today. 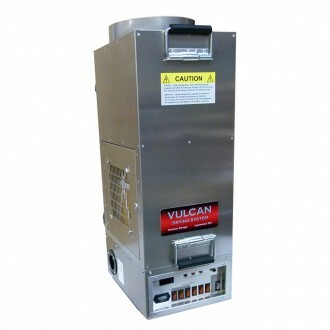 The Vulcan and the Vulcan RT can provide up to 180°F of dry heat and have been specifically designed to work well with modern LGR’s and other specialty drying equipment such as high pressure drying systems. 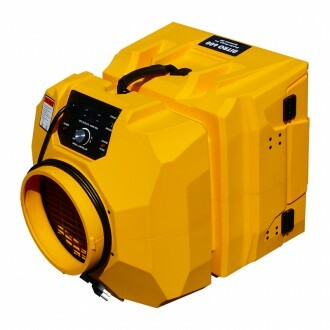 Maximize your drying efficiency and effectiveness by using the Vulcan or the Vulcan RT electric heat dryers on your next hard to dry job or on any project where boosting the ambient temperature levels will provide faster and more efficient drying. Airborne contaminates and dust are a significant consideration for almost any restoration project. Studies have shown a substantial increase in air particulate matter during the drying process. Not only do dust and contaminates affect your worker’s safety, but they also the safety of the post-restoration occupants. Just increasing the air circulation doesn’t remedy the situation and without adequate filtration, may actually create more problems. 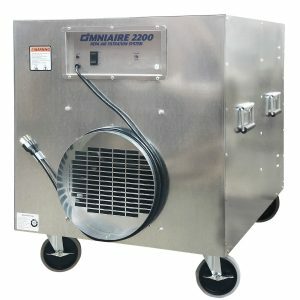 OmniAire’s HEPA air filtration machines are industry recognized as among the best available. By filtering the jobsite air through HEPA filtration, you not only reduce the airborne contaminates and dust, but you also increase air-flow throughout the dry-out project and maintain a safer, cleaner environment. With our extensive line of OmniAire HEPA air filtration machines, we are able to meet whatever size restoration project you may have. Try out our air flow calculator to see which machines are the best suited for your jobsite needs. In addition to dust and airborne contaminants, there can often be the additional issue of mold spores, bio-contaminates and the need to maintain sanitation levels during the restoration process. For this purpose, Omnitec Design has developed the PEROx air purifier. 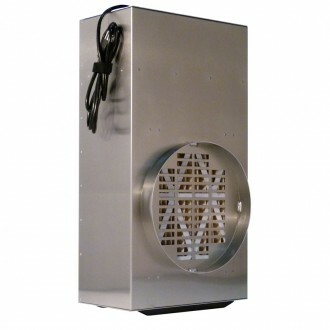 The PEROx air purifiers are designed to control biological contaminants, mold spores, odors, and VOCs as well being able to support sanitized air and surfaces during the restoration process. PEROx air purifiers generate hydro-peroxide ions which are a proactive method of indoor air sanitation without the use of additional chemicals and can safely be used in occupied spaces through restoration and in final cleanup of restored areas. Omnitec Design makes both a stand-alone model and an add-on module to our other machines. We are proud of the quality of all of the products we manufacture. The OmniAire Air filtration machines and Vulcan heaters meets NEC requirements and were tested by NRTL, TUV lab and are UL and CSA/IEC compliant for electrical safety. All our machines are manufactured in the United States and are individually tested to ensure the highest quality, well-built equipment designed to serve your needs for years of trouble free service. Whether you are involved in water damage restoration, fire and smoke damage restoration, or the structural drying aspect of the restoration industry you will find success by using the best tools available. We are confident that you’ll find our quality machines to be the best tools and the best value on the market. As restoration projects vary in size, accessibility and types of contaminants, the size of the equipment has to be considered. 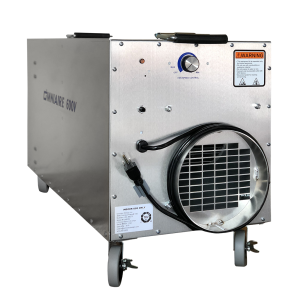 The line of OmniAire HEPA air filtration systems offers the most versatility and our machines are used as air scrubbers and negative air machines on all types of restoration projects. OmniAire machines have a reputation for quality construction, reliable service and are easy to maintain. 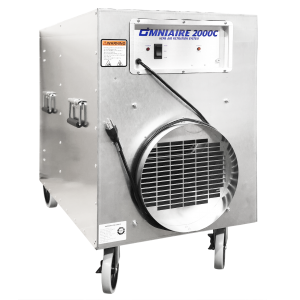 OmniAire HEPA air machines are sold throughout the US , Canada and are often tested at the jobsites to DOP or equivalent efficiency tests. Our machines come with standard, 12” deep HEPA 99.97%, 0.3 micron or optional HEPA 99.99%, 0.3 micron individually tested and certified filters. OmniAire HEPA negative air machines come in many sizes and configurations. To accommodate the variations of the required air flow, our variable speed controller is standard on most of our equipment. Omnitec Design features product for both large and small jobs with various options to fit your needs. In general, these names are just a marketing terminology. When Air Filtration Machine is used to create negative pressure in containment, it is often called Neg Air machine. When used for re-circulation and purification of air in open area, it could be called Air Scrubber or Air Filtration Machine. OmniAire machines are built to provide a high quality service in any environment and application. Your specific requirements regarding airflow, type of project, accessibility are the important factors in choosing right equipment for you. See our comparison of OmniAire HEPA air filtration machines. 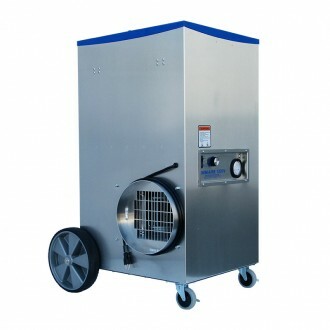 Use of negative pressure containment with HEPA air filtration prevents spread of asbestos fibers, mold and other contaminates to the outside of contained work area, All exhausted air is purified by HEPA negative air machine to create negative pressure and required air changes (ACH) inside the contained work area. In order to create a negative pressure environment more air must be exhausted from the space then leaking in. 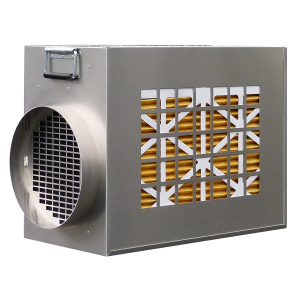 See our air flow calculator to assist you with your airflow requirements. Dustlock primary/secondary filter should be replaced when its orange, downstream side shows signs of discoloring by dust. Our dual density poly media captures particulates in full depth of the filter media rather than on the surface, as pleated filters do. The media is treated with tactifier to prevent release of captured dust and antimicrobial additive to prevent growth of virus and bacteria. Frequent replacement will help to maintain high airflow and protect the more expensive HEPA filter. The HEPA filters should be replaced when the airflow decreases below your requirements or when pressure (WC) across the filter increases to recommended replacement pressure – See User Manual. Some of our OmniAire air filtration machines are equipped with a simple filter change light to indicate that filters should be checked or replaced. HEPA filters become even more efficient when loaded with particulate matter, but the airflow resistance increases and the airflow could be reduced to zero. Average HEPA filter life is 800 t0 1000 operation hours.